For the updated version this article that uses Azure Kubernetes Service, see Access the Kubernetes web dashboard in Azure Kubernetes Service (AKS). This walkthrough assumes that you have created a Kubernetes cluster using Azure Container Service. It also assumes that you have the Azure CLI and kubectl tools installed. If you don't have the az tool installed, there are instructions here. This should open a web browser configured to talk to a secure proxy connecting your local machine to the Kubernetes web UI. In the Kubernetes web UI, click Create button in the upper right window. A dialog box opens where you can start creating your application. Give it the name hello-nginx. 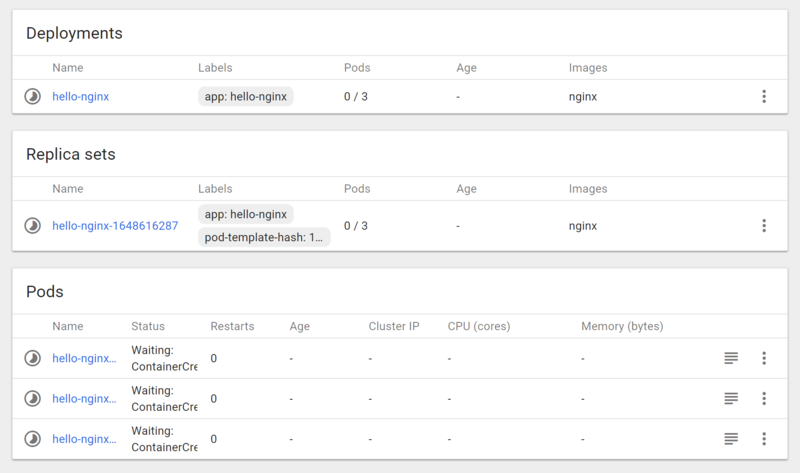 Use the nginx container from Docker and deploy three replicas of this web service. Under Service, select External and enter port 80. This setting load-balances traffic to the three replicas. Click Deploy to deploy these containers and services. Once everything is running, click one of your pods to see details about the running web service. If you don't see the resources, you may need to wait a few minutes for the monitoring data to propagate. To see the logs for your container, click View logs. In addition to running your containers, the Kubernetes UI has created an external Service which provisions a load balancer to bring traffic to the containers in your cluster. In the left navigation pane, click Services to view all services (there should be only one). In that view, you should see an external endpoint (IP address) that has been allocated to your service. If you click that IP address, you should see your Nginx container running behind the load balancer. In addition to viewing your objects in the UI, you can edit and update the Kubernetes API objects. 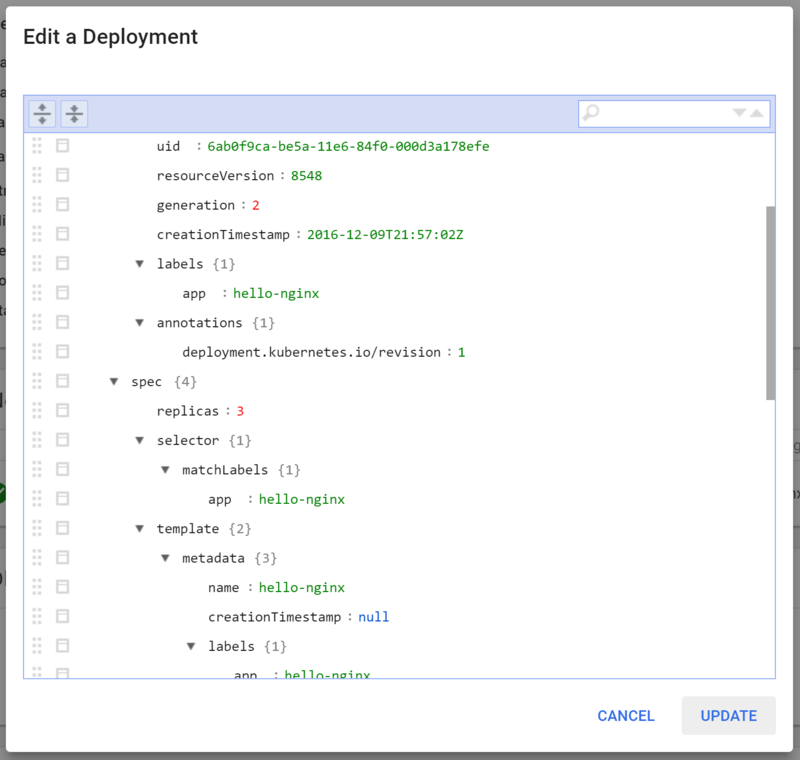 First, click Deployments in the left navigation pane to see the deployment for your service. Edit the spec.replicas field to be 2, and click Update. This causes the number of replicas to drop to two by deleting one of your pods.